A simple truth – nonprofits can’t survive on donations alone. They need to be smart about their funds and find additional ways to generate revenue. This is where an appropriate investment strategy can help. Fortunately, the last few decades have seen tremendous changes to the investment landscape. Investment alternatives and strategies that were once reserved for only larger organizations are now available for small and mid-sized institutions and nonprofits as well. Many smaller organizations, however, haven’t adopted these newer options that would allow them to improve the risk and return of their investment portfolios. So, where to start? First, consider the long-run when it comes to an investment strategy. Portfolio growth needs to be achieved to attain its sustainability over time. Without growth, a portfolio can lose its ability to support the goals of the organization due to the impact of inflation, cost and spending. Once an organization has come to terms with the idea of remaining invested for the long-haul, other investment factors need to be considered. 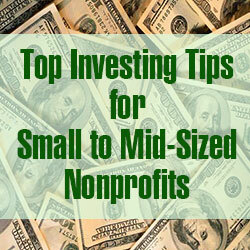 The following tips, considerations and recommendations will help any nonprofit get its portfolios on the right track. In a market where a traditional allocation of stocks, bonds and cash is no longer the ideal approach for pursuing an organization’s financial goals, smaller nonprofits now have the ability to employ more diversified strategies and invest in additional asset classes. Newly available products provide access to additional asset classes, including real estate assets, commodities and alternative strategies. In particular, nonprofits can now access these alternatives through the use of mutual funds and exchange-traded funds (ETFs). Having a diversified portfolio also has the potential to enhance returns. The investment landscape is constantly changing and solutions and strategies continue to evolve at a rapid pace. It’s easy to become complacent with an investment strategy, especially one that continues to yield returns. But you may not be getting the biggest bang for your buck and having the proper guidance is essential. Working with an investment consultant that specializes specifically in money management for nonprofits can bring attention to these evolving trends and help to take advantage of products that are now more readily available. How is your portfolio constructed? While no investment strategy can guarantee success, an institutional investment consultant can also help determine which asset allocations have an increased likelihood of returns. Proper portfolio construction is crucial to maintaining the portfolio’s desired risk and return characteristics in order to help meet your organization’s long-term financial goals. Nonprofits and their investment consultants should monitor portfolios regularly to ensure the desired asset allocation is maintained. In some cases, adjustments need to be made in order to enhance a portfolio’s potential. Revisiting market assumptions and rebalancing your portfolio annually with your investment consultant may also improve performance, increasing the chances for a positive return. Is your policy consistent with your mission? Re-evaluating an organization’s investment policy is just as important as rebalancing its investment portfolio. Are the guidelines still consistent with your nonprofit’s mission and purpose? Short and long-term goals should be reassessed as well. The investment policy review process allows for changes to be made and helps confirm an institution and its investment consultant have a mutual understanding of the organization’s desired investment outcomes. Finally, how much will this cost? Like anything else, it’s important to understand all costs and fees associated with your organization’s investment strategy. We’ve seen too many organizations overpay for money management services simply because they’ve been priced like a retail account. Nonprofits should work with an investment consultant to ensure that all processes are efficient as possible – unnecessary costs can also be a drain on the portfolio’s performance. With all of the products that are now accessible to nonprofits, any organization can begin to emulate investment strategies of the largest institutions. Once a nonprofit has committed to investing for the long-term, an investment consultant can help define the organization’s needs and goals and determine the appropriate course of action. But don’t seek the guidance of just anyone, do the proper due diligence to find the right fit for your organization and to ensure that they have a thorough understanding of institutional investing. Bret Sinak, MBA, AIF®, and Ron Portell, CAP®, are co-founders and managing directors of Endeavor Wealth Management, one of the few wealth management firms to specialize in investment consulting and money management for institutions, foundations and endowments. Sinak and Portell utilize over 30 years of combined experience to help philanthropic entities plan for their financial needs. Visit www.endeavorwealthmgt.com for more information. Note- Securities and advisory services offered through LPL Financial, a registered investment advisor, Member FINRA/SIPC. Investing involves risk including the potential loss of principal. No strategy can assure success or protects against loss. Asset allocation does not ensure a profit or protect against a loss. There is no guarantee that a diversified portfolio will enhance overall returns or outperform a non-diversified portfolio. Diversification does not protect against market risk.